Štadión Antona Malatinského used to be one of the most famous stadiums in Slovakia, also among the largest. Used to, because demolition of the northern end started last week and ended in last days of April. Two more stands are awaiting demolition (east and south), all to be replaced with double-tiered new sections with only the west stand getting a facelift instead of complete reconstruction. Capacity shouldn’t change much, is expected to be around 17,500 for UEFA games and 19,000 at peak. 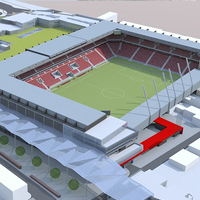 The stadium itself isn’t expected to cost too much, priced at some €15-16 million ($20-21 million), but since it’s financed privately by Slovak shopping mall giant Euro MAX, the complex’s commercial part will be a lot more extensive. Consuming nearby training pitch, four houses and a parking lot, the mall conjoined with new stands will be L-shaped and have 4 floors. Two lowest levels will hold 1,150 cars, while to upper ones are to provide the commercial outlets in Trnava’s most attractive spot.